"The world has become really corrupt and this is how it can be corrected," says Jahar as he confidently takes another puff from his hemp pipe. 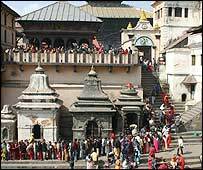 Jahar is in the Pashupatinath Temple in Kathmandu to mark Shivaratri, one of Hinduism's biggest festivals. The festival celebrates Shiva the destroyer and reaches its zenith on Wednesday night. Jahar's neighbour, Swaminanda Bramhacharya, a 40-year-old Indian sadhu or holy man, joins him in a puff. 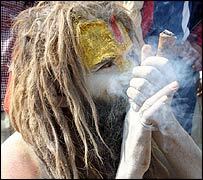 "In the name of Lord Shiva," he chants as he takes the pipe. "The whole universe belongs to him and this is his style. I am trying to imitate him." Many ascetics have travelled here from all over the Indian subcontinent but not everyone will share the pipe. Just across the Bagmati river, in a wood, other devotees calmly adopt their yogic postures. Popularly known as the Naga Babas, these mystics are naked. They say being naked is a form of yoga. Kedar Puri, from the Indian city of Indaur, has a bell tied to his manhood. Every time he stands it rings and draws the attention of passers-by. He has photos displayed showing a novel and seemingly agonising means of pulling trucks and jeeps. Kedar has not spoken for two years but his friend, Balak Puri, says: "People may find this weird. But we are students of yoga and this is how we practise it." Nearby, about 10 holy men are sitting around a pyre. The most senior, Saninath, is 50. His matted hair almost covers his shoulders and he is not of a mind to cut it. "When Lord Shiva himself sports such long hair, how can we dare cut ours?" he asks. "I will get it cut only when I attain enlightenment." The holy men are the centre of attraction for tourists visiting the temple, a world heritage site. The tourists zoom in their camera lenses and the holy men get donations. Many of the sadhus realise their commercial value and make good money. Another source of revenue during Shivaratri is selling hemp to local people, especially youths. Hemp, marijuana and such drugs are banned in Nepal but during Shivaratri consumers are allowed to use them on religious grounds. For one day and one night at most. The wandering sadhus have a longer-term plan. They will continue to live their lives just the way they do this Wednesday - the day and night of Lord Shiva. Hindu nationalism: Harmony or discord? Hindu nation: What role for religion?